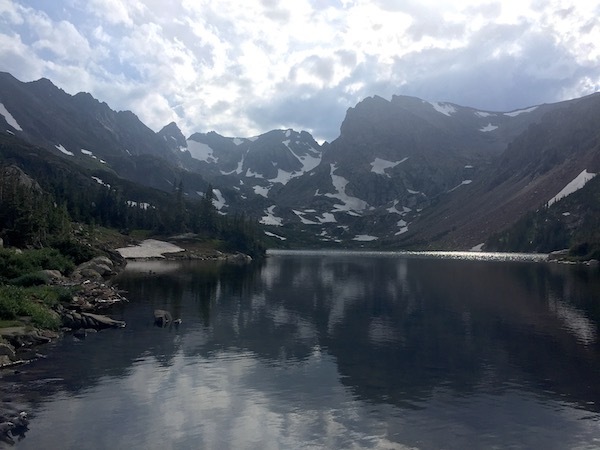 Finally made it up to Lake Isabelle, an every-summer hangout in the Brainard Lake Recreation Area, located (for the uninitiated) near the Continental Divide just west of Ward on the Peak to Peak highway about 40 minutes west of Boulder. I suspect many readers know it well. You usually don’t want to go before July 4 because there’s still too much snow. On this day, there was only that one snowfield that is the last to go, on that final ascent to the lake. I’d waited a bit too long. Parking was impossible at the Long Lake trailhead, even on a weekday, before about 3 pm. So, I warmed up by hiking to Mitchell Lake, from the adjacent trailhead of the same name, then found several parking places at the Long Lake trailhead (which also accesses Isabelle) at about 3:30. A late start cuts down the crowds, which are reliably huge early in the day at Brainard. Here’s a short video of what I saw. Apologies for the video quality, as the fast-cuts were shot with an iPhone app called Movie360 that splices together consecutive shots for you, you lazy videographer you. If you wait too long into August to do the one-hour hike from the trailhead parking up to Isabelle, you’ll be very disappointed at some point to see that the lake has been largely drained to supply water to farmers on the plains east of Boulder. This can provide an effect that you might find either eerily interesting or kind of depressing. Go now. This particular Monday also beat the Monsoon Season by a couple of days, as it rolled in later that week. Oh, yes. Take mosquite repellent. Not always that bad, unless it’s cloudy, and unless you stop moving. Then they may be pesky. By the way, I encountered not many other hikers, and I’d say close to two-thirds of those I encountered were from Boulder and environs, rather than tourists. How’s your High Country rambling going this summer? Got a hike to recommend? Drop us an comment, below. I was at Brainard a few days prior and it was cool, overcast and uncrowded, with only a smattering of mosquitos and locals. The muted skies made for muddy photos, but nothing an HDR Photoshop filter couldn’t handle! Excellent, Bob! I look forward to my first hike up there this summer. What have I been doing??? Glad to see you’re having some good times over the summer. Looks like you had a beautiful hike.